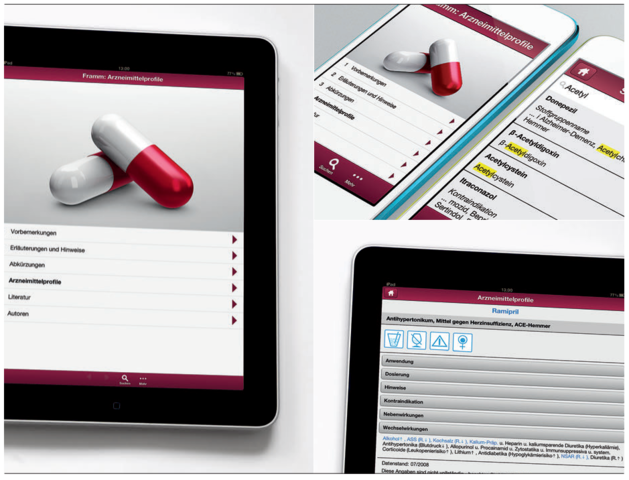 Given that every pharmacist has their smartphone in their lab coat pocket anyway, it made perfect sense to bring out the popular pocketbook reference work on drug profiles “Arzneimittelprofile für die Kitteltasche” as a mobile app. “Framm” is a perfect example of cross-media publishing. The editors use an online editor directly within the DaBi content management system and can generate a preview PDF in the print layout from the XML data on the fly for each drug profile. le-tex can convert the whole XML data set into Android and iOS apps at any time with no manual reworking.